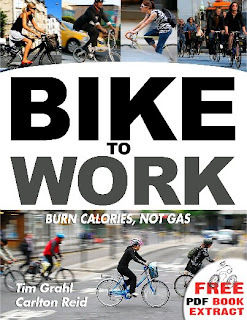 There's a new book which is intending to be "the definitive guide for bike commuters," the soon to be published "Bike To Work Book" by Carlton Reid and Tim Grahl. I've written a short piece for it too, as have the bloggers at Amsterdamize and Copenhagenize. It looks to have quite a varied content. When published in December it will be both downloadable and available in a printed version. An extract is currently available online, and the website for the book is here. Once I can get it listed, I'll add it to our online bicycle books shop.